When we arrived in Mexico nearly one year ago, Trisha began telling fellow cruisers about our plans to spend the summer in the northern Sea of Cortez. The typical marina cruiser responded with warnings of unbearable heat and widespread misery while sheepishly confessing that they, themselves, had never actually spent a summer in the Sea. Fortunately for us, we met actual veterans from past summers in the Sea who were infinitely more knowledgeable and helpful. These folks became good friends and mentors. As we reflect upon the adventures and struggles of the last three months, we raise our glass to those who coached us to success: Scott and Monica on Scott Free, Patrick and Laura and son Jack on Just a Minute, Chuck on Jacaranda, Rick and Pam on Hotel California, Rich on Third Day, Ethan and Nancy on Eyoni, Alan and Barbara formerly on Native Son, and Kevan on Alex II. Thank you all for your patience and eagerness to help. We endeavor to pay it forward with the same wonderful spirit. As many of you noticed, we did a poor job of keeping up with the blog during the summer months. For this, there are several good excuses: the weather was too rough, it was too hot, and hunting and gathering food took too much time. While all of these are true, it would be more accurate to confess that we spent too much time hanging out with friends, playing Baja Rummy, exploring beaches, and generally enjoying ourselves. We understand that reading about parties, card games, and beaches can get really boring, so we will focus on the first set of excuses. A bonfire on a white sand beach with our friends Conor and Lanea of Moondance - Priceless! When it comes to rough weather, we were most concerned about chubascos (large storm cells that randomly strike) and hurricanes. During a happy hour gathering in Loreto, Laura from Just a Minute stressed to us that it was not a matter of ‘if’ but ‘when’ we will see fifty knots of wind at anchor. This freaked us out a little and kept us on our toes. During chubasco season, basically the month of August, every night we raised the dinghy, folded and stowed the shades, and put away all the toys in preparation for fifty knots of wind. Now that we have been through two chubascos, one with gusts over sixty knots, we have become religious about hunkering down nightly. We are very grateful to have missed out on seeing a hurricane. Hurricanes Miriam and Paul had us rushing to the shelter of Puerto Don Juan, the nearest hurricane hole. Thankfully, both of these storms weakened and arrived as remnants. Thanks to our chubasco experience, riding these out was no big deal. The heat was a much bigger deal. Each morning we covered the boat with white tarps to shade the deck and cabin from the blazing sun. This helped, but the temperature inside the boat regularly climbed above 90 degrees. Fortunately, Hotel California had some fans they wanted to sell. We never would have survived the summer without the four additional fans we installed in the main cabin and galley. With the heat also came electrical challenges. In addition to fans running constantly, the refrigeration ran around the clock struggling to keep the box cold. With all of this extra demand for electricity, the big surprise came when we learned that solar panel output declines as temperature increases. Talk about adding insult to injury. We had to run the generator twice a day to keep the batteries charged. Just one final note about a summer in the desert, heat rash. Enough said. Even when it’s hot and miserable, the crew still needs to eat. We keep the boat well stocked with rice, pasta, dry beans, and canned goods (beer falls into this category). There is no freezer on board, so when it comes to protein we have to go out and get it. Our trusty spear gun has paid for itself over and over again in this department. Every two or three days, I would go out spear fishing and return with two or three fish. Trisha frequently made requests for certain species: “I want a grouper and a trigger fish.” It is not unusual for us to eat fish twice a day. Favorite dishes include fish tacos, breaded fish, fish fried rice and our most favorite dish, fish bowl. Fish bowl consists of fried fish over steamed rice with soy and Sriracha sauces and is a great dish for breakfast, lunch or dinner. 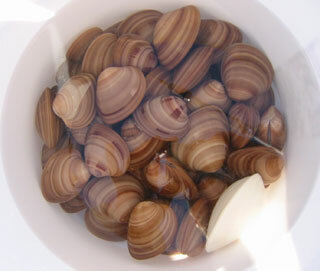 When available, we gather clams and Trisha makes a fantastic linguini with steamed clams. 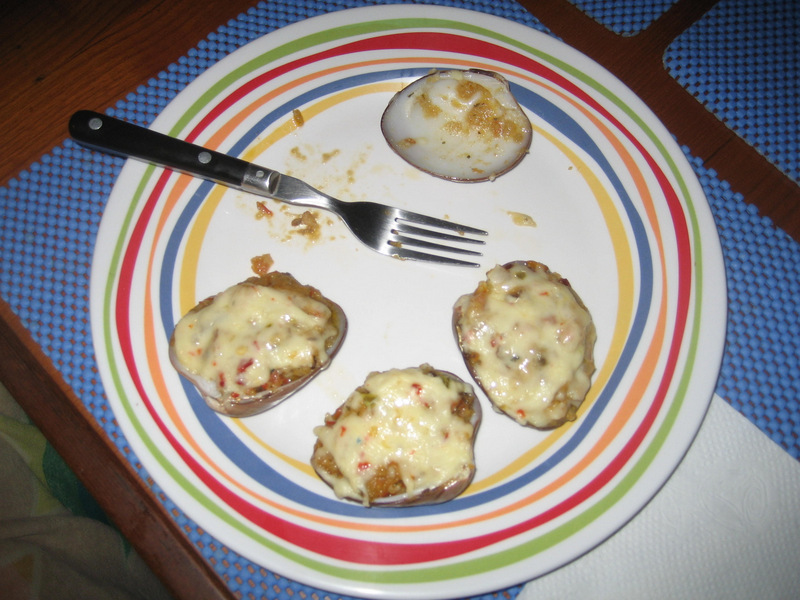 Late in the season, Trisha discovered an awesome stuffed clam recipe for the larger chocolate clams (named for their brown color). I now spend hours scouring sandy bottoms for chocolates. A real treat is scallops when we can find them. 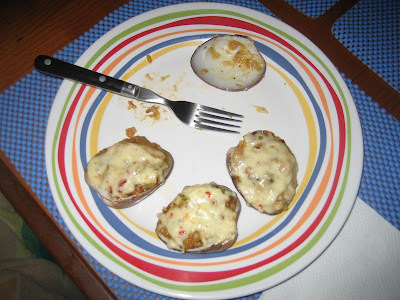 These were the most plentiful in the very remote Puerto Refugio. Unfortunately, our total scallop haul for the season provided only six dinners. Overall, spending the summer in the Sea of Cortez is a truly wonderful adventure, but not for the faint of heart. One must be prepared for chubascos, heat, bug bites, rashes, and a limited menu (unless they have a freezer onboard). With this gauntlet of misery mastered, a cruiser is free to enjoy the countless anchorages, beautiful scenery, abundant wildlife, and camaraderie of fellow cruisers. At the end of summer party on Sept 30th in Puerto Don Juan, it was apparent that this handful of sailors shared a special bond: we had survived the summer in the Sea together. It was late September when Hurricane Miriam turned out to be a false alarm. Many relieved sailboats had gathered in the vicinity of Puerto Don Juan's hurricane protection. With the storm breaking up and a crowd already gathered, an impromptu meeting of the party committee determined that the time was right for a full moon celebration. Trisha was adamant that the announcement of the party should, in no way, suggest the end of hurricane season. Hurricane season goes on through October and it makes no sense to tempt the fates. On September 30, a group of nearly thirty cruisers got together for a potluck on the sandy spit in Puerto Don Juan. It was the best party of the summer. Early the next morning, two of the boats weighed anchor and began their hurried trip south. Trisha and I were in no hurry, planning to take our time cruising around Animas Bay and burning up more of the hurricane season clock before leaving the safety of the northern Sea. Nearly two weeks had gone by when we found ourselves anchored with five other boats in Bahia San Francisquito. The next leg for all of us was an eighty mile, overnight passage to Santa Rosalia. Rumor had spread through the anchorage that the marinas in Santa Rosalia were full with boats waiting to get in. With a tropical storm brewing in the south and a Norther forecasted to be blowing through in a day or two, we thought it best to stay put rather than travel eighty miles only to find no room at the inn. The other five boats headed to Santa Rosalia. The boat rolled wildly the day of the Norther driving us to the brink of insanity. After a long day the local weather finally settled down, but we kept a close eye on that tropical storm. The storm became better organized and was given the name Paul. Three times a day we downloaded and analyzed the forecasts from the National Hurricane Center. We strategized about what we will do if it comes our way. At four in the morning on Tuesday, October 16, the latest forecast indicated that our worst case scenario was becoming reality. An hour later the anchor was up and we were on our way back to the shelter of the nearest hurricane hole, Puerto Don Juan. During the nine hour trip we enjoyed flat water, light wind, a nice push from the current and several pods of dolphins swimming nearby. It was like the calm before the storm. We arrived in Don Juan to find very calm conditions and four other sailboats at anchor, including our friends on Moondance and Grace. The good news was that the latest forecast showed Paul weakening. As darkness fell, I began to think that we burned all that diesel fuel for nothing. Any regret quickly faded the next morning when the wind came up and it started raining. Our morning has been quite rainy and windy with sustained winds in the twenties and several gusts to thirty knots. Don Juan is protected by hills on all sides, so when it's windy in here it's quite awful outside, especially in places like Bahia San Francisquito. Admittedly, our hurricane avoidance practices are quite conservative but we are happy with the results. We finally have a somewhat decent internet connection so we will be posting pictures from our summer in the northern Sea of Cortez. Trisha with Zeda from Eyoni in Don Juan. On August 13th we arrived in BLA which will be our "home base" for the next few months while we wait out hurricane season and explore the northern Sea of Cortez. We had planned to visit many anchorages along the way between Bahia San Francisquito and BLA but plans change. We had a part that needed to be welded in order to run our generator. We contacted a few cruising friends to see if there was a welder in BLA and Patrick on Just a Minute saved the day. Patrick hooked us up with a couple who live in BLA that offered to help us out. We anchored in front of their house on La Mona and dingied in. We were driven in their 4-wheeler into BLA village five miles across some very rustic roads. I was struck by the beauty of the surrounding area both by land and sea; it reminds me so much of Death Valley (one of my favorite places). We accomplished our mission by finding a welder who not only fixed our problem but strengthened the weld. We have found the Mexicans to be hugely resourceful, being able to make do with available materials and able to repair most anything. In addition to the repair, we also got a grand tour of the village and stopped at each tienda and picked up a few provisions. Feeling good about the accomplishments of the day, we retired to the boat for a relaxing evening. About 10pm, the winds began increasing very rapidly and within 10 minutes there were 30-35 knots. We were about to experience our first big chubasco. A chubasco is a summertime convection storm that can be accompanied by high winds, thunder, lightning and rain. In a short time the winds were increasing to 40 and 50 knots and the lightning was all around us. The best was yet to come; we saw several gusts of 60-62 knots before things were to begin calming down. (Note: To put things in perspective, a hurricane category 1 has winds of 64-82 knots) In all, the high winds lasted about 1 ½ hours and the rain was not even enough to fully clean the boat. Whew! It's good to have our first chubasco in the rear view mirror. We came through it okay, no damage and we took note of a few things we might do differently if and when the next one hits. We plan on spending a few more days here in BLA before heading to some of the anchorages we passed on our way here. Also to hook up with our friends Pam and Rick on Hotel California who have returned from the states and are heading this way. Our Baja Rummy skills have improved greatly since we saw them last! Interabang was ready to make the eighty mile passage from Santa Rosalia to Bahia San Francisquito on Friday, July 27. The plan was to leave late at night expecting to arrive at our destination in the middle of the afternoon the following day. 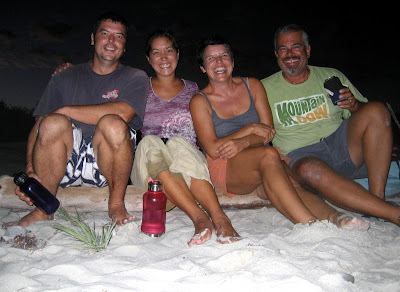 We shared our plans with Tom and Jeanne on Eagle and they wanted to buddy boat with us with one stipulation. In order to avoid the bad luck associated with leaving port on a Friday, we would postpone our departure to just past midnight, thereby technically leaving on Saturday morning. Bill and Lisa on Beyond Reason just happened to be leaving at the same time so we had three buddy boats. The passage was uneventful until the last four or five miles. The guidebook warned of strong currents possible in the channel outside of San Francisquito and we found this to be an understatement. As we neared the channel we noticed big waves with whitecaps ahead. Upon entering the rough water we found confused seas with large waves, some as high as eight feet, coming at us from multiple directions. Navigating the channel was slow going with the boat bucking and rolling wildly for about thirty minutes. Once through the slop, it was a short two miles to the anchorage where we joined three other boats. Our friends Kyra and Rick on Nyon and John on Time Piece arrived a couple of days later. Unfortunately, we arrived at San Francisquito with a water maker problem. The feed pump had burned up during the trip and we would soon be out of fresh water. I studied each of the spare and installed pumps on the boat trying to find one that would meet the specifications but had no luck. Remembering that Tom on Eagle was a water maker service guy, I gave him a call on the radio. Lucky for us Tom had a spare pump that would get us by. Awesome! We fired off and email to Rick and Pam on Hotel California. They were visiting family back home in California. They saved the day again by agreeing to pick up a replacement pump and bring it back to Mexico for us. San Francisquito presented us with the first opportunity to use the spear gun. On my first time out, I came home with three opal eye. The friendly fish are available in large numbers and are an easy mark. Comparing notes with other cruisers, we learned that the opal eye was essentially a 'B List' fish. "Good for tacos" someone said. Trisha encouraged me to target more tasty species and leave the opal eyes. With coaching from Rick on Nyon and Tom on Eagle, I was soon able to identify and hunt the fish on the 'A List.' I bagged twenty fish during our stay including chubs, grunts, porgy, and three of the highly prized and delicious leopard groupers. San Francisquito also provided us with our first chubasco experience. A chubasco is a big thunderstorm with scary high winds that come at night. As we have learned, the flashing lightning generated by the chubascos can be seen coming from far away warning of their arrival. We had a rather light chubasco with winds peeking in the mid-thirty knot range. The winds were a little scary and the continuous lightning was amazing. We saw any form of lightning you can imagine from large bolts shooting straight to the ground, to long streaks across the sky, to wide fans of little bolts that filled the sky like fireworks. It was a scary night with an amazing show. After a little over two weeks in San Francisquito our stay abruptly came to an end when we had a part fail on our generator. Santa Rosalia is our last provisioning stop for the remainder of hurricane season. The months of August, September and October will be spent in the remote northern Sea of Cortez. We will be able to buy provisions in the village at Bahia Los Angeles, but this place is so far off the beaten path that everything is very expensive. Veteran cruisers have stressed to us time and again that we need to stock up in Santa Rosalia. Each day we walk into town with a shopping list and return with bags of food. Interabang does not have a freezer, so perishables like meats and produce will only be available to us for a couple of weeks from the dock. We stock up on staples and load every available space to capacity. 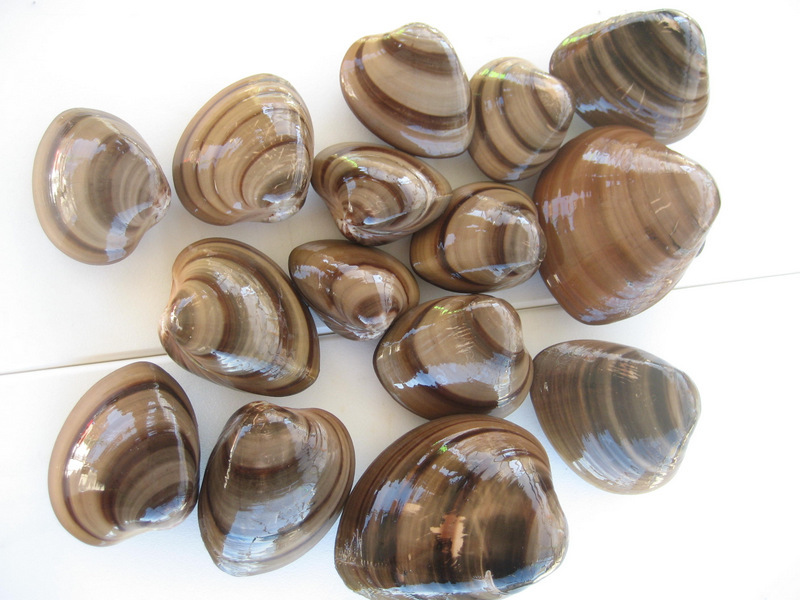 Fishing and clamming will soon become our main source of protein. Beer is another challenge. How much beer will be needed for three very hot months? How are we going to get the beer from the store to the boat? These are challenging questions. When Eagle and Time Piece arrived at the marina they were also looking to stock up on beer. The three boats got together and determined that we each wanted five cases. Fortunately for us, my friend Carlos at the Deposito (beer store) resolved our delivery problem. I have done a fair amount of business with Carlos and developed a good relationship with him. He speaks absolutely no English so negotiating the deal took time and strained my limited Spanish and Carlos’ patience. After a couple of trips back and forth between the marina and the Deposito, Carlos and I worked through the details and shook hands. He would borrow his friend’s car and deliver fifteen cases of beer to the marina at ten o’clock the following morning. The next morning at a quarter of ten, I was in the cockpit putting on my shoes when a smiling Carlos came walking down the dock. One of the greatest things about cruising is the way cruisers help one another. Our outboard motor was overheating and Rick from Hotel California diagnosed the problem as a bad impeller. Bob on Nirvana, the boat next to us in the marina, was going home to Sacramento for a couple of weeks and offered to bring the part back for us. The part was shipped to Bob’s house. Bob’s plans changed and he got delayed, but he remembered that Bill from Beyond Reason (another boat in the marina) was also visiting the Sacramento area. Trisha found Bill’s email on the Beyond Reason blog site and emailed it to Bob. Bob contacted Bill, arranged a rendezvous, and handed off the part. Bill showed up at the marina with the part a day earlier than originally planned. The outboard is now back on track. Finally, Trisha and I want to give a big thank you to Ed and Connie on Sirena. They were kind enough to loan us their air conditioner after they left for California. Santa Rosalia is quite a hot and humid place. Thanks to Ed and Connie, we spent most of our days here in luxurious comfort. We’re going to miss that air conditioner when we’re gone. On July 4 at 0600, Interabang and Hotel California began the forty-five mile trek from Bahia Coyote to Santa Rosalia. We planned to spend a night at anchor somewhere along the way thereby breaking the trip into two short hops. Once out of Bahia Conception, Interabang sailed slowly along and ran the water maker while Hotel California scouted ahead. Rick and Pam took a look at the anchorage on the north side of Punta Chivato and reported that the southeast swell was wrapping around the point causing an uncomfortable roll. Sweet Pea Cove on Isla San Marcos was our next option. Hotel California was anchored at Sweat Pea and relaxing in the cockpit when Interabang arrived. Unfortunately, the anchoring didn’t go so well. We dropped the hook five different times in various places around the cove, but the anchor wouldn’t hold. The Bruce Anchor dragged each time we powered the boat in reverse to test the holding. Frustrated, we decided to sail the additional ten miles to Santa Rosalia and grab a slip in the marina. 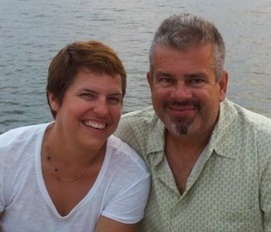 This is Rick and Pam’s second year in the Sea and they were excited to return to one of their favorite towns. Hotel California led the way. Santa Rosalia is a charming old copper mining town originally operated by the French. The quaint downtown area features European style buildings and houses constructed with wood shipped down from California. Food is a big part of the Santa Rosalia experience and we were lucky have Rick as our culinary guide. After we got tucked into the marina, Rick took us to a great pizza restaurant. The next day, he took us to an excellent street vendor where we had the first of many fish taco breakfasts. Another popular street vendor served bacon wrapped hotdogs. We could only handle eating these fatty treats on a couple occasions. One night we hiked up the hill with Rick and Pam from Hotel California and Ed and Connie from Sirena for some really good Chinese food. It was difficult for Trisha and I to get used to the Chinese restaurant staff speaking to us in Spanish. We took a tour of the mining museum which is the old administrative building for the mine. A very friendly fellow who spoke no English was our tour guide. He showed us the antique furniture, fixtures and equipment. He showed us maps and photographs from the old mining days and led us into the vault where the city records have been stored for more that a hundred years. We didn’t understand half of what he was saying, but he gave a great tour. The big cultural event was the Mariachi concert held in the main town square. A professional mariachi band was touring with a stop in Santa Rosalia and played for a couple of hours. We attended the concert with Rick, Pam and, apparently, everyone else in town. We had a great evening of music and people watching. Rick and I took turns fetching beers from the Tecate booth. As the concert was starting to wind down, we noticed a couple drops of precipitation. Next thing you know, we were racing back to the marina in heavy rain. On the morning of June 30, Eagle, Hotel California, Seychelles and Interabang left La Ramada and began a forty-five mile passage northwest to Bahia Conception. A light wind pushed on the extended mainsail as we motor-sailed with two fishing lines in tow. Several miles past the mountainous rock at Punta Pulpito, a nice sized dorado hit the cedar plug. Trisha was very excited to see the beautiful bright green fish as I hauled it to the stern and grabbed the gaff hanging from the radar pole. The fish was jumping and fighting wildly. After a failed gaffing attempt the fish suddenly made a twisting lunge out of the water and slipped the hook. We didn’t get another bite the rest of the day. The good news was that a flock of boobies soon arrived to provide entertainment. About twenty birds flew all around the boat and hovered over our fishing gear occasionally diving and tugging on the lures. Luckily, none of the birds got hooked. One booby landed on our bow pulpit and put up quite a battle as Trisha tried to persuade him to leave. The wind piped up considerably as we altered course to the west and began rounding Punta Conception. Interabang was flying along at seven to eight knots. Once clear of the point, we sailed past the boats anchored in Bahia Santo Domingo and continued south into the bay. We navigated our way through the shallow water with one eye on the depth sounder. There were several stretches where Interabang’s keel was five feet from the bottom as we made a long curve west around a big shoal to Playa Santispac. We found a spot to drop anchor and once the boat stopped moving we were slammed by the stagnate hot air. Veteran cruisers had told that they were never as hot as they were in Bahia Conception and now we were getting first hand experience. The water temperature had increased to 88 degrees and the heat was suffocating with no wind in sight. We headed to shore with Hotel and enjoyed a meal onshore at the local restaurant. At dinner, a young man joined our table – he had ridden his bike from Canada all the way down to the Baja peninsula! After dinner we wilted in the cockpit. After midnight it was still not cool enough to go below and get in bed. We came to Bahia Conception for the annual Fourth of July party in Burro Cove. The party is hosted by Gary, a gringo resident who provides the cruisers with the weather forecasts on the morning radio net. We had heard stories about the hazardous after-party fireworks show, so Hotel California suggested that we drop the hook out of the line of fire in nearby Coyote Cove. The wind came up and helped a little with the afternoon heat, but the water was too warm for swimming. By the morning of the Fourth we were tired of being hot and not so interested in doing a potluck. We decided to celebrate the Fourth by heading to Santa Rosalia. It was June 25. When the sun came up in San Juanico we were happy to have a long night of rolling behind us. We pulled up the anchor and motored a mile or so to the northern end of the bay in search of better protection from the heavy southeastern swell. Hotel California arrived first and found a sweet spot in shallow water tucked in behind some big rocks. We were unable to locate a similarly protected patch of water that was deep enough to accommodate Interabang’s nine foot draft. Then we remembered seeing our friends on Eyoni pass by San Juanico the day before presumably headed for La Ramada, an anchorage just two miles further north. Trisha was able to call Eyoni on the VHF radio and learned that the water in La Ramada was flat calm and there was plenty of room for more boats. We were soon on our way with Hotel California close behind. Interabang and Hotel California joined three other boats already at anchor in La Ramada including Eyoni. We enjoyed a peaceful night’s sleep. The next morning we took the dinghy to the beach and hiked over the hills back to San Juanico to visit the cruiser’s shrine. We soon found the tree where cruisers have been leaving mementos for many years. There were several pieces of sandstone carved with dates from the early 1980’s and countless other trinkets and pieces of artwork in various states of decay. Interabang’s contribution was a rubber duck we picked at a Baja-HaHa party. We used a sharpie to add our boat name and the year 2012 then attached the toy to an inner branch with stainless seizing wire. On the hike back to La Ramada we found several pieces of obsidian that have come in very handy for holding down playing cards during windy Baja Rummy games. The following day, I stopped by Eyoni and asked Ethan if he could teach me how to make the replacement bands for my spear gun. When it comes to spear fishing, Ethan is the best of the best. He came aboard and I handed him the obviously well-used gun. He was immediately impressed with its design and quality. He looked it over carefully giving me several repair and fine tuning tips. Using his own material, he made me a couple of new spear tethers. Then he showed me how to make the bands. Ethan was a great help!!! All he asked for in return was a cold beer now and again down the road. That afternoon, we took our snorkel gear to the beach to try our luck at a little clamming. On our way north, we had been coached by several cruisers on how to spot a chocolate clam hiding under the sand. It took about an hour of studying the sandy bottom and several trial and error dives to finally come up with the first clam. As the name implies, chocolates are brown in color. They are about the size of a pack of cigarettes and buried under an inch or two of sand in four to eight feet of water. After a couple hours we had collected thirty clams. That night Trisha made her famous linguini and clams dish. It was fabulous. We did a little more clamming the next day. After two days of practice, Trisha had become a clamming champ regularly adding to the haul. Just as we were going to call it a day, I found a huge yellow clam. It was great fun showing off the big guy to the other snorkelers, but Trisha let it be known that she found the monster quite intimidating. After a brief photo session we tossed him back in the water. That is one BIG clam! The highlight of our five days in La Ramada began one morning when a northbound ketch sailed into view from behind the point. She was a little over a mile offshore and flying a spinnaker. We watched the boat for quite a while and when it was about three or four miles away we noticed that she had lost control of her kite. The sail was now flying horizontally from the top of the mainmast. The boat turned around and slowly starting making its way to the shelter of La Ramada. Eventually the spinnaker was back under control but obviously badly damaged. The crew was unable to get the sail down. When Karmasea finally arrived at the anchorage we saw that the boat was singlehanded. The spinnaker was still hoisted with tack and clew tied together. When the ketch passed close by I ask if he needed a hand. He said he really could have used me an hour ago but now would be great. As soon as the boat was anchored I jumped in the dinghy and went aboard Karmasea to meet Pitt. Pitt was an unusual guy with short hair and a beard made up of three braids. Pitt got his gear together for going aloft and began climbing the mast. Ethan from Eyoni and John from Seychelles quickly arrived and we went to work getting things squared away. It wasn’t long before the damaged spinnaker was back in the back in the bag and Ethan, John and I were on our way. Later that day John on Seychelles organized a BYOB happy hour on the beach for all of the boats in the anchorage. The new arrival, Pitt on Karmasea, had volunteered to provide the entertainment as a thank you for the help he had received. Come to find out Pitt is a balloon- twisting fire-eater. All of the dinghies showed up on the beach for happy hour. As the drinks were drunk and the snacks disappeared, Pitt was busy making balloon art for the kids and the ladies. He does impressive things with balloons including a very entertaining sword swallowing act using a sword fashioned from a balloon. Finally it began to get dark and twenty or so people sat together on the sand waiting for the main event. When Pitt started lighting his torches everyone was captivated. There is something fascinating about seeing fire in the dark. Pitt put on a very impressive show while telling great stories about how he had learned his art. When Pitt finished his last act and the last flame was dowsed a vigorous round of applause ensued. Suddenly, as if choreographed, the space station could be seen sweeping by in the sky. It was a magical night. 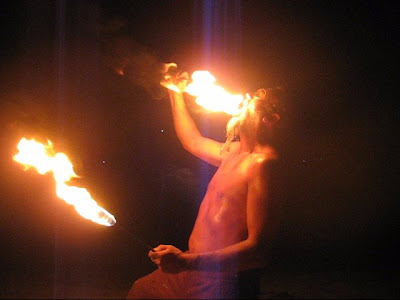 and he eats the fire!